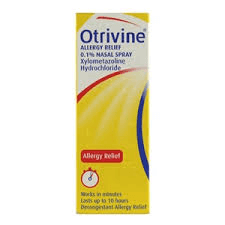 Otrivine Allergy Relief is a nasal spray which contains the active ingredient Xylometazoline. Xylometzoline helps to open up and clear the nasal passages by reducing the excessive nasal secrations and returning the swollen blood vessels to their normal size. 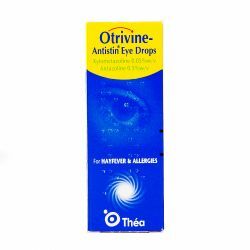 Otrivine Allergy Relief is only suitable for adults and children over 12 years old. Otrivine Allergy Relief should be kept out of sight and reach of children and should not be stored above 25 degrees celcius. Once opened, the bottle should be discarded after 28 days. The recommended instructions for using Otrivine Allergy Relief is one spray in each nostrol two or three times a day. Shake well before using the spray. Only use the spray in the nose and do not swallow the spray. If you use too many sprays, speak to your doctor. If you forget to use the spray, take your next dose at the usual time, never take two doses together. The active ingredient in Otrivine Allergy Relief is xylometazoline hydrochloride 0.1% w/v. Other ingredients include benzalkonium chloride, sodium phosphate, disodium edetate, sodium acid phosphate, sodium chloride, sorbitol, hypromellose and purified water. Otrivine Allergy Relief should not be used if you are allergic to any of the ingredients in the medicine, if you are under 12 years of age or if you have had recent neurosurgery. You should speak to your doctor before using Otrivine if you have an overactive thyroid gland, glaucoma, diabetes mellitus, have heart or circulatory diease or if you have hypertension. You should make sure to mention if you are taking any other medicines, including medicines obtained without a prescription especially monoamine oxidase inhibitors or other antidepressants. If you are pregnant, think you may be pregnant or breast feeding, you should speak to your doctor before using Otrivine. As with all medicines, Otrivine Allergy Relief can cause side effects, although not eveyone gets them. You should stop using Otrivine and speak to your doctor if you have an allergic reaction to the spray. 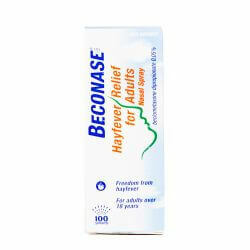 Local discomfort may be felt after applying the spray if you have sensitive nasal passages. Other side effects may include a burning sensation in the nose and throat, local irritation, nausea, headache, dryness of the nasal membranes and temporary and passing visual disturbances. If you have heart problems you may get some cardiovascular effects, such as palpitations.